I did not do a great job of keeping the blog running this month. Such a big month as well. Tai finishing work – last day of work was March 6th. Followed by three days for her visa cancellation. Lots of running around in Dubai – getting our deposits refunded from DEWA and Empower was a headache. Dara was great – putting us up for the last week in Dubai. Selling the apartment. Leaving Dubai. Shipping our belongings to Bangkok. Flying over to the USA. Some holiday – some flying – a few days in Mexico. My flying blog from Sarasota is on another page – I got four days of flying and almost 13 hours. Lots of IFR time and some night flying. Good experience. 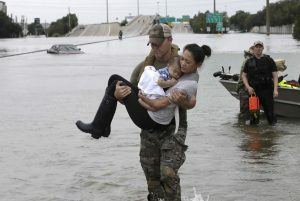 Awful scenes from the floods/hurricane damage in Houston – this is just one picture from many. People do good things in adversity. AP Picture via the Guardian. I have been sick as a dog for the last few days. We arrived in Los Angeles on Wednesday evening after a long haul on Philippines Airline. The flights were fine. Just long. But by morning I was feeling bad – we had a Delta flight out of LAX to Orlando in the afternoon on Thursday. Arrived Orlando at 11pm – the queue at Avis was long and slow. Painfully slow. Note to myself. I must not let stupid people make me angry and I should not say things that are best kept to myself. However much it is deserved! Awful events in Barcelona. The fact that it could have been so much worse is not a consolation. The severe cold/flu tablets do not seem to be doing much good…..everything hurts – the cough is painful and the congestion miserable. Not happy. We were going to head to Cape Kennedy today. No chance. And now we are in Bangkok – and so hopefully is our shipment! More on all of that below – or above! “A military coup has swept over Thailand and the Thai army is holding Thailand’s first female prime minister under house arrest. Her popularity is a threat to army rule so things are about to get messy. There will be a show trial to convict her of corruption and send her to prison. Then, when she’s behind bars, she’s going to be murdered. The only way to save her life is to get her out of Thailand before the trial starts. 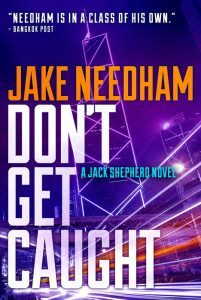 Jack Shepherd is the kind of lawyer people call a troubleshooter. At least that’s what they call him when they’re being polite. Shepherd is the guy people go to when they have a problem too ugly to take to anyone else. He finds the trouble, and then he shoots it. Neat, huh? If life were only that simple. This was a big day – we completed the sale of our Executive Towers apartment. Payment received – cheques banked. Nice family moving into the apartment – and I hope they are happy there.